Habit: Annual, perennial herb; rosette 0; hairs spreading, glandular or not. Stem: < 100 cm. Leaf: blade < 55 mm, ovate to rounded-cordate, irregularly dentate; petiole < 75 mm. Inflorescence: dense, nodding. Flower: opening at dusk; hypanthium 4.5--14 mm; sepals 3--9 mm; petals 3--12 mm, yellow or cream. Fruit: 20--55 mm, ascending, cylindric, +- straight; pedicel 1--18 mm. Seed: 0.5--0.7 mm. Chromosomes: 2n=14. Habit: Occasionally some hairs glandular. Leaf: cordate. Flower: hypanthium 4.5--12 mm; petals 3--12 mm. Citation for this treatment: Warren L. Wagner 2012, Chylismia cardiophylla subsp. cardiophylla, in Jepson Flora Project (eds.) 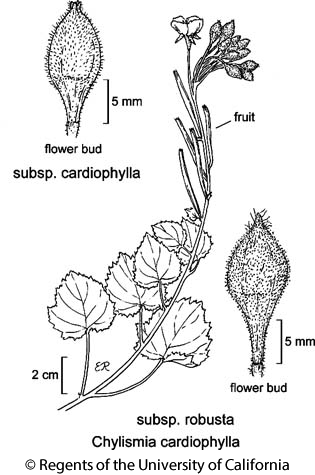 Jepson eFlora, http://ucjeps.berkeley.edu/eflora/eflora_display.php?tid=89214, accessed on April 22, 2019.
c&s DMoj (San Bernardino Co.), DSon; Markers link to CCH specimen records. Yellow markers indicate records that may provide evidence for eFlora range revision or may have georeferencing or identification issues. Purple markers indicate specimens collected from a garden, greenhouse, or other non-wild location.